Do roof coatings meet building codes? Yes, National Coatings’ roof coating systems are fully compliant with federal, state and local building codes and energy conservation programs. Our AcryShield roof coatings meet rigorous standards set by ASTM, AIA, FM, ICC-ES, UL, ENERGY STAR, CRRC, Miami-Dade County, and LEED. Get more information on our credentials and ratings, here. Do Cool Roofs really cut energy consumption and costs? Why is roof restoration better than a new roof? Roof restoration dodges a costly tear off, new material costs and labor fees to replace your existing roof. You avoid contributing to already congested landfills and the fee’s associated. Roof coating systems restore your roof and can save you 50-70% less than replacing your entire roof. Installation is quick and non-disruptive, allowing your business to remain open during application. What are some signs that my roof needs a maintenance system or restoration system? Definitely any leaks or water penetrations need to be addressed immediately. If you notice and cracking, split seams, scrim exposure, shattering, blistering and excessive granule loss (for BUR roofs) you should contact a roofing professional. Can only certain types of roofs be restored? Our roof coating systems can be applied over a wide range of substrates including: Asphalt, BUR, Mod Bit, Concrete, EPDM, Hypalon, Single-plies, TPO, PVC, Metal, and Spray Polyurethane Foam. If we haven’t answered your questions – Contact one of our Roofing Professionals, we are here to help you – 800-423-9557! Elastomeric is an adjective for the noun “elastomer”. An elastomer is a term used for a polymer in the roof coating that has the elastic properties of a natural or synthetic rubber (in the case of roof coatings, it is a synthetic rubber). The elastomer allows the roofing coating the ability to be flexible as the roof substrate expands and contracts during temperature fluctuations. What types of roofs can the coating go over? Roof coatings are designed for low-slope roofs only. This means the slope of the roof is less than or equal to 3:12 or 14 degrees. How long will a roof coating system last? Our AcryShield roof coating systems can last up to 20 years with proper roof maintenance performed at least twice a year – check out our 8 Step Guide for Conducting a Thorough Roof Maintenance Inspection. These AcryShield roof coating systems are also renewable/sustainable, allowing your roof to last indefinitely, avoiding a costly and timely tear-off forever. Read our A Truly Sustainable Roofing Product article or contact us for additional information: 800-423-9557. Why go with a white coating? 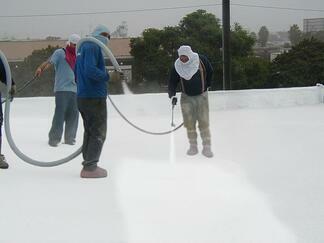 A white roof coating has the ability to reflect the sun’s heat away from the building. This not only keeps the air temperature inside the building at a cooler temperature, but it also protects the rooftop from premature aging and drying out. The sun’s heat/UV rays are the leading cause of damage to a roof because once the rooftop begins to dry out, it cracks, splits, tears, rips, loses it’s flexibility, etc… causing leaks and other failures to occur. The AcryShield coating line has multiple white roof coatings, each with different benefits. Both the AcryShield Ultra Reflective A590 and AcryShield High Reflectance A179 have reflective capabilities as high as 92%. That leaves only 8% of the sun’s heat from being absorbed into the roof membrane, slowing down the aging process of the roof tremendously and keeping the building much cooler. 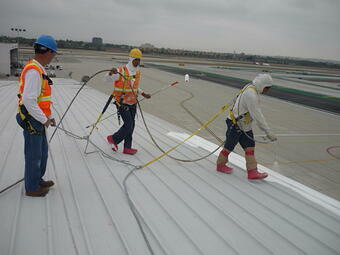 “After the National Coatings' Cool Roof was installed we definitely noticed a difference in building temperature. It's not a marginal difference, either. It is between 15-20 degrees cooler inside the warehouse and store." Jerry Moore, the Facilities Director at Harbor Freight Tools noted. Download our “Cool Roof” Versus “Normal” Roof brochure for more information! How long does it take a roof coating dry? Generally speaking, roof coatings take 8-24 hours to thoroughly dry. The time span difference really depends on weather conditions. Dew and high humidity will cause the coating to take longer to dry. 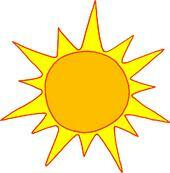 Hot temperatures with dry weather will allow the coating to dry at a much faster rate. If you are looking for a fast-setting coating, we offer a line of QuickSet products that “set-up” quickly, resisting early wash-off associated with light rain and heavy dew. Download the QuickSet Brochure for additional information. What are the advantages of restoring my roof with roof coatings? What causes the most damage to my roof? The Sun! Roof coatings with highly reflective capabilities are able to protect your roof from the greatest cause of roof failure – UV rays / the Sun’s heat. The UV rays break down the surface of your roof, essentially drying out the exterior, losing its ability to expand and contract with temperature fluctuations. This leads to cracking, splitting, tearing, leaking and other failures. Roof coatings protect your roof by reflecting a majority of the sun’s heat away from the building, allowing your building to remain flexible. An added benefit to a highly reflective coating is also energy consumption and cost savings as the building remains cooler when the roof absorbs minimal amounts of heat. Check out our AcryShield A590, it can reflect up to 92% of the sun’s heat – guarantying superior roof protection and energy cost savings. Should I be concerned if my roof has blisters? Yes, blisters are typically an indication that moisture is trapped between the roof deck and membrane. You should have this looked at by a professional as soon as possible. Do your systems come with any warranties? We offer product guarantees and full system warranties ranging from 10, 15, and 20-year. Contact us for more information. Do you have any roof coating contractors you recommend? Yes! National Coatings works with list of contractors who have been approved by our approved applicator program. These contractors are qualified based on a list of criteria covering the contractor’s overall business operations and its track history in quality workmanship and performing roof installations. Contact us for more information on our approved applicators. If you are interested in becoming an approved applicator, apply here. If we haven’t answered all your roofing questions, please feel free to contact us today at 800-423-9557 or fill out our form online - Contact A Roofing Professional. We are here to help you!